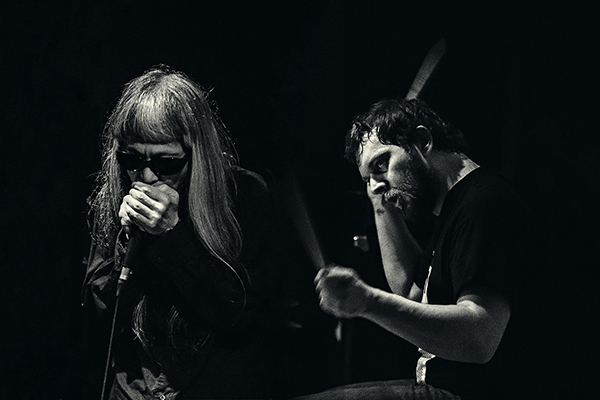 Stemming from the Antonin Artaud-inspired theatre milieu, since the beginning of the ’70s Keiji Haino explores such fields of music as psychedelic, improvisation, minimalism, noise and drone. From 1973 until 2013 banned by the Japanese public broadcaster NHK, he co-founded such ensembles as Fushitsusha, Vajra or Nijiumu, and has also collaborated with artists as varied as i.a. Peter Brötzmann, Derek Bailey, Tatsuya Yoshida, Pan Sonic or Jim O’Rourke. After his concerts with Stephen O’Malley (i.a. Sunn O))), Khanate or – a joint operation with Haino himself and Oren Ambarchi – Nazoranai) and Zeitkratzer at 2014′s AAF, the Japanese experimentator will appear on stage with a Hungarian drummer Balázs Pándi. The abovementioned, regularly cooperating with Merzbow, has recorded with such artists as Venetian Snares, Otto von Schirach, Justin Broadrick, Bill Laswell, Zu or Wadada Leo Smith. A collision of two concepts of improvisation is coming our way.